Riding a motorcycle with the stock headlight is often troublesome. This isn't an indictment of the OEM headlight as much as a result of a combination of anti-dazzle laws, moderate light outputs and the corrosive effects of undipped oncoming headlights and the worst of all, wet roads. It is primarily to support the head light in these conditions that you look for an auxiliary light or two to gain more vision after dark. And just like having the headlight on makes your more visible, having auxiliary lights running in the day makes your motorcycle stand out and has a positive safety implication. Human drivers tend to not crash into things they can see. Here's a quick primer on how these lights work, what they're for and how to find the one you like. Why do I need auxiliary lights? Not every rider needs them. If you ride a lot within the city, mostly in daylight, you don't need them. Extra lights serve a purpose though. The shallowest of them is the look of the bike. Adding these to a gigantic adventure tourer does look good - and there is always the danger that you will overdo it. But the real purpose to fill in the gaps that your OEM headlight leaves and have a backup source of illumination. Both of these apply more to the big distance rider and adventurer than almost any other kind of rider. The second is easy to understand. LED headlights rarely fail. But bulb-type headlights are more fragile, although the failure rates today are very low. And in that event, a second set of lights might be enough to get you home. The real reason is to complement and supplement the headlight. For example, if you ride in off-road terrain a lot, especially early in the morning, you might want more light near the bike at the front and on the sides so you can see more and ride better. Or if you, like me, like to cover substantial distances in the quiet of the pre-dawn dark, you might want powerful lights that reach further than the headlight can so that your mile-munching happens with confidence and clear vision. 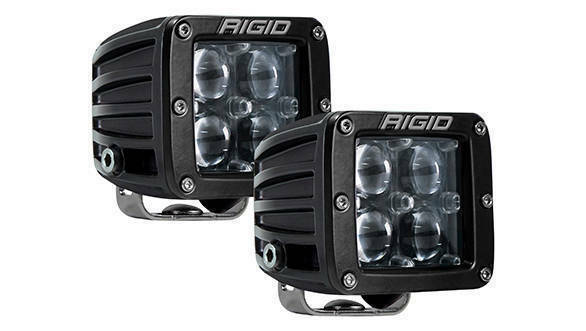 What makes them offer more illumination compared to the stock lights? There are two reasons. First is the law. Headlights and all forward illumination are tightly controlled by regulations. This is because they are the most powerful lights on the vehicle and they can easily blind oncoming traffic which is more than an annoyance, it's actually dangerous. Aftermarket and auxiliary lights are usually marked as "for off-road use only" which means they don't follow the laws. Second is the cost. 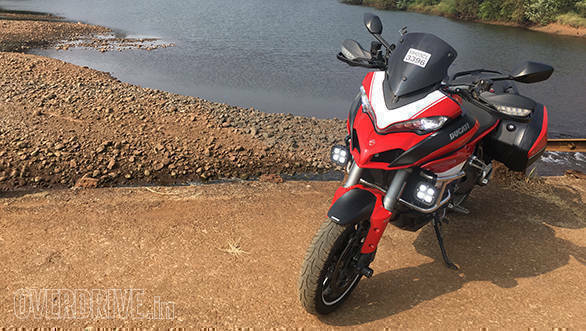 You wouldn't accept a Rs 30,000 LED headlight on a Rs 2.7 lakh KTM 390 Duke if it were OEM equipment. The law-abiding halogen headlight is very cheap and in proportion to the cost of the motorcycle. When it comes to adding the lights though, your budgeting may or may not be in proportion to the cost of the motorcycle. Yes, but how did they get so powerful? The aftermarket light market was slow until LEDs arrived. The reason lies in how they're made. Big brands like CREE make millions of LEDs which are classified (and then priced) for their quality. This quality determines the quality of the light, power, consistency and reliability. The variation in price between top drawer LED chips and the worst ones is night and day. But the little LEDs produce startlingly bright illumination with low power consumption, very little failure rates and not a lot of heat production. This means its easy to produce a light pod with two, three, four, six or more LED chips in reflector housings that produce extremely bright beams that run on paltry amperages and wattages. More powerful light sources are now available too, but the price band of the LED auxiliary light is hard to beat at the moment. In general, the lights are classified into four classes. Floods, spots, hyperspots and hybrids. These classifications are based on the sort of light pattern they produce. Which also tells you what they're meant to do. The hyperspot is the specialist among the auxiliary lights. It casts a very narrow beam, you'll read a figure like 5° or 6° as the light beam description. At close range, like if you point it at a wall, you will see an extremely bright and well-defined circular light beam. The narrow beam projects light over huge distances. A 3,000-3,500 lumen beam will usually carry a 1 lux distance of 600m or greater. The truly impressive ones can usually hit 900-1,000m. These beams are excellent for high-speed highway work when you'd like early warnings of what's ahead. Usually, a hyperspot is the last light you get. This is because the specialised nature of the light beam means it doesn't light up anything else except whatever is in front of the light. Focusing a hyperspot is critical, from the illumination perspective as well as in terms of the risk of dazzling oncoming traffic. The Spot beam is a great source of confidence for the rider. It projects a 10-15° beam that shoots out over a good distance and isn't too narrow like the hyperspot. There's a well-defined circle of light but it's a notably bigger circle than the hyperspot and it reaches a little less into the ether. A 3,000-lumen spot beam can easily hit 3-400m. The wider circle of light, once again, means focussing the spot beam is important to its utility and you have to careful not to dazzle oncoming traffic. Most focussing instructions suggest choosing to align the hotspots of the beam exactly aligned with the motorcycle but dipping so that at 100ft, the beam dips 2 inches or 5cm in height from the center of the light. As the name suggests, a flood beam projects a an extremely large circle of light ahead of the light unit. This is good for filling in the gaps that the low beam of the motorcycle might have. Floodlights can be extremely bright and they project really wide light beams, you will see numbers like 80° or 120°. Focussing a flood beam is about minimising dazzle for oncoming traffic because the wide nature of the beam means exact light unit focus isn't crucial to the operation. A hybrid or driving pattern usually uses multiple LEDs set up with a combination of spot and flood lenses to produce a beam that balances the distance of the beam and the width of the beam. 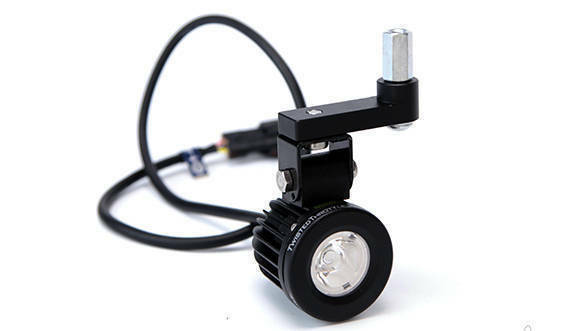 These are perhaps the most useful of the lights to add to a motorcycle with weak headlights because their job is to produce a reasonably wide beam with a significant distance. 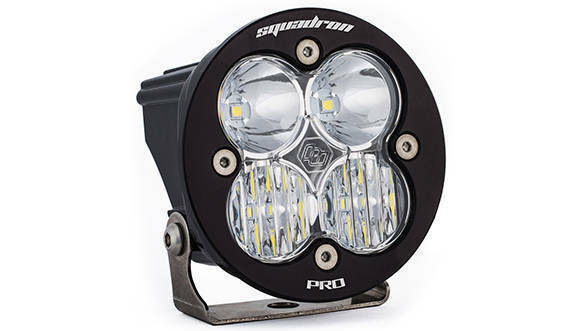 Some of the smarter lights will give you the option to change the lenses so that you can choose how many forward pointing LED units are working as floods or spots depending on how you'd like to help the motorcycle headlight. Unless you're turning your motorcycle into a Christmas tree, you add the lights for a purpose. If you're going slowly off-road on a trail, you'll need floods. If you're looking for long distance vision in the night, you'll want a hyperspot or spot depending on your specific requirement. That's the first thing, what is the light supposed to do for you. Then comes the logistics of it. That's amperage and wattage and whether your motorcycle's electrical system can handle the load. Usually, the LEDs are so efficient that this is a non-issue. Then based on both of these considerations, budget and aesthetic predilections, the actual brand and model selection. The trickiest bit though is to find a power line the lights can use. Most will mount the battery directly for power with an inline fuse. But they all need switched power. That's a power line the light can tap into which comes online only when the ignition is turned on. This part has to be attacked carefully. If you cut or splice a wire, you could void your warranty. On most touring machines, you already get uprated alternators for heavier power draw. What you're looking for is a blank GPS power outlet or secondary (unused) cigarette lighter socket outlet. If you can match the connectors (there are many standard types across the OEM ranges), you can use the bike's wiring as it was intended without any cutting or splicing. Your option is a PosiTap connector that everyone seems to include which neatly drills a tiny hole in the switched power insulation. It's a neat solution but you can still be accused of cutting into an OEM wire for warranty purposes. On the Ducati, we found switched power in the GPS power socket which is a Deutsche-style male connector mounted next to the headstock. We located an unused female that we wired the switched power line into. Plug it in, and we have power without cutting anything. What do the specs on the box mean? There are three sets of specifications that we have to pay attention to. The easiest to grasp is the dimensions. Pay attention to the size of the light. That's the front of the light in width and height. And then the length of the heat sink behind the bezel, or the depth. 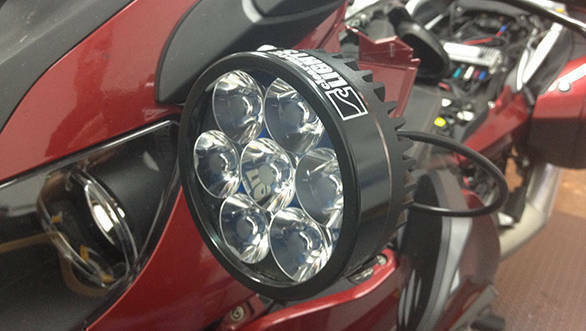 Since the light makers overlap products for motorcycle, off-roading and construction applications, you have to ensure the light is sized right. Next comes power specifications in Amperes and Watts. Watts is an expression of power, but typically of consumption more than output though many people do the light bulb thing and extrapolate that a 4W light is twice as powerful as a 2W light. Amperes is a unit of current and its perhaps the slightly more relevant unit in terms of circuitry and wiring. All motorcycle circuits have a load rating and you cannot overload these without risk. What that means is that you cannot add two 5A lights (or other electrical items) to a 10A circuit and then add a, say, phone charger also without the risk of blowing a fuse or having a wire melt. Finally, come the measurements of the light the unit puts out. We've already explained the types of beams. But the additional numerics that accompany it are as follows. Lumens and Lux are the two units that you will see most often. They're expressions of light intensity. Lumens measure the total light output. That's all the light in all the directions - which is a sphere for a pin-point light source. Lumen counts range in the thousands for most LEDs today but you have to take a small pinch of salt. Actual lumen counts usually are below the printed number. Lux is a more useful unit in the sense that instead of light everywhere, it focusses your attention on a useful are. Lux, then is lumens over a specific area. Candelas, in fact, is a light intensity over an area unit. And the more focussed the area, the bigger the candela counts get. The candela is the luminous intensity, in a given direction, of a source that emits monochromatic radiation of frequency 540×1012 hertz and that has a radiant intensity in that direction of 1683 watt per steradian. Before you pull your hair out, what it means, simply is the light measured in a specific direction. Steradian is a solid angle - think of it as a cone projecting from the light source. The distance at 1 Lux is an interesting way to measure light intensity. You're meant to be able to read a newspaper comfortably at 1 Lux. Which means there is enough illumination for you see what's what. 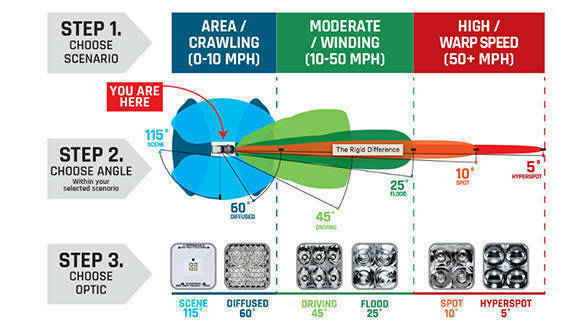 The distance, usually in feet or meters, tells you how far the LED in question will throw that much light. Light temperature determines how yellow or blue the light will be. The temperature is expressed in Kelvin, or K. Higher numbers are bluer and the lower numbers denote a yellower light. Typically lights below 3000K look yellow. Fog lamps usually sit at around 2700K. 4-5,000K is where the white lights sit, 5,000K being distinctly bluer in hue. Above this is usually the blue lights that usually bring the police to you. LED chip specifications are often published including voltages and other minutiae. I tend not to pay too much attention to them. But that's because I am more likely to pay for a higher priced brand. The more unknowns there are, the more attention you need to pay to this. Rated life is the life expectation of the LED. Normally, this is tested under a thermally stable condition to produce a number that you can rely upon. But given that most of these LEDs promise 50,000 hours, I guess this is more a hygiene check than a real spec. Most LEDs should promise 36,000 to 50,000 hours or more. Where should the lights be positioned to get maximum illumination as well as protect them during crashes? Maximum illumination is a function of the light. Floods do well almost anywhere because the illumination is a big, even hemisphere projecting from the pod. But higher positions are better because they create smaller shadows. The shadows can hide a hazard behind a crest. Spots are easier to use mounted lower because the chances you'll blind someone are lower. Hyperspots even more so. 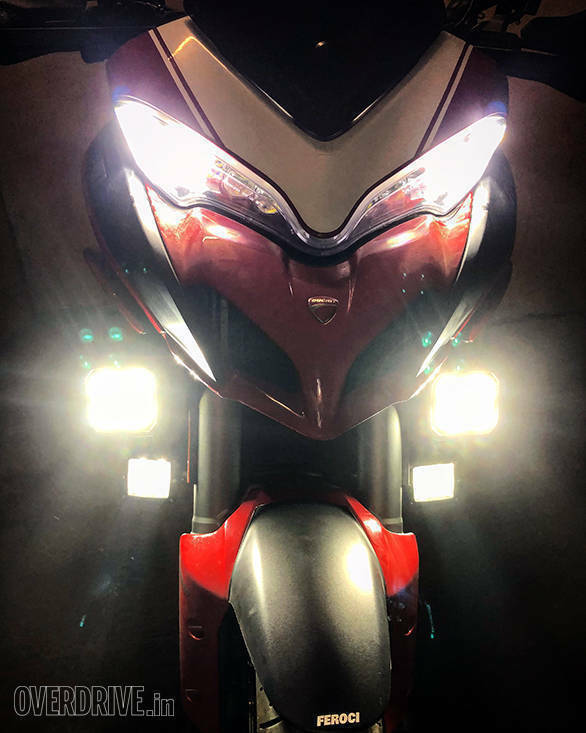 It's hard to do on a motorcycle, but in inclement weather, having a light mounted above the eye level can produce more obstruction through reflections of falling rain or snow than actual illumination. Normally, anywhere from the handlebars to roughly the top of the mudguard is a good height to mount them. Protecting them from crashes is a whole different challenge. First point of hope is that most good well-made LED pods are designed (and destined) to be placed on the outside of the vehicle, in harm's way. So they feature robust casings and tend not to break as much as scuff in crashes. But the trick is to mount them as inboard as possible. On a motorcycle with a comprehensive crash bar, you might ensure that all the light pods are inside the bar so that the bar takes the big impacts in a crash. 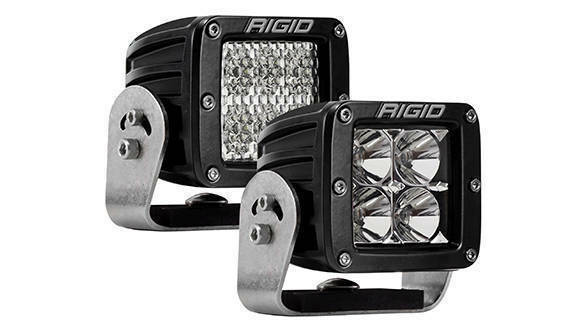 Will mounting the lights affect the handling of my motorcycle? Generally not enough to notice since each pod weighs between 400 to 800g on average. Obviously having four lights means you now have 3kg of light and wiring tacked on, but I would be surprised if you'd notice the difference in normal riding. Will the additional lights drain my battery? Like we noted before, in general, LEDs are so effective at producing light that their actual current consumption and load on the system is generally negligible. 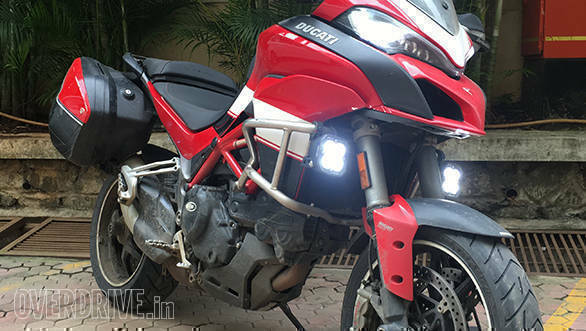 Most of the lights barely need 5A, which is usually the weakest of your bike's circuits, the cigarette lighter charger socket. Even with four lights, you'll be running barely 8A which is easy to handle. So in most cases, unless your battery or regulator-rectified has a problem, or you have an old bike with a weak alternator, LED lights will not cause problems. If you're adding other kinds of auxiliary lights - HIDs, high power bulbs etc - you need to pay attention to the ampere and watt ratings and then check your manual. Where can I get these lights? They're everywhere. The cheap unbranded, no guarantees LEDs start at Rs 2,000 at the local bike bazaar. These are often extremely bright. But the light is poorly directed and if it fails, you won't be entertained in the shop you got them from. That said, for most urban applications they're bright enough to make themselves count. Next come the branded Chinese ones like the ones from Gold Runway or Auxbeam etc. These get from Rs 6,000 to Rs 15,000. They are sold by a range of entities that mostly appear on the Facebook bike sales groups. And AliExpress. I don't believe these have any strong guarantee mechanisms but I could be wrong. The big brands are represented in India. Big Bad Bikes, MotoUsher, EverythingOffRoad etc. all sell the big names. The names you'll hear are Rigid Industries, Denali Electronics, Baja Designs and Cyclops. That's in order of how expensive they are. Clearwater are considered to be the gold standard. But they're also extremely expensive. A set of rally-ready Selvinas (or the Baja Designs Squadron Pros) will easily run you past Rs 60,000 or more. 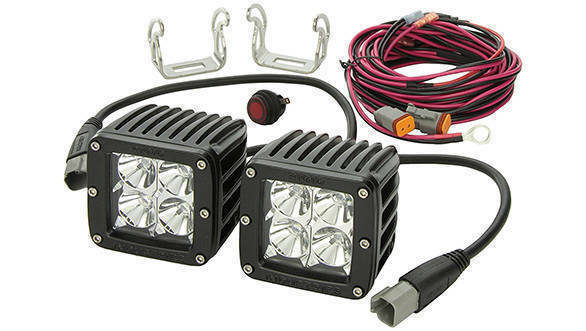 If you head for the branded lights, start at the Rigid Dually or D2 range. These small 3" cubes produce a lot of light. And they come in all kinds of beam patterns. Usually about ?12-15,000 for a pair in the US, about ?20,000 in India. Denali repositioned their idiotically bright D4s and the price hits ?21,000 in the US and about ?32,000 via Big Bad Bikes after duties and taxes. The D4 is a very flexible light that comes with lenses you can change to achieve spread, throw or a combination. If budget isn't an object, get something more powerful. 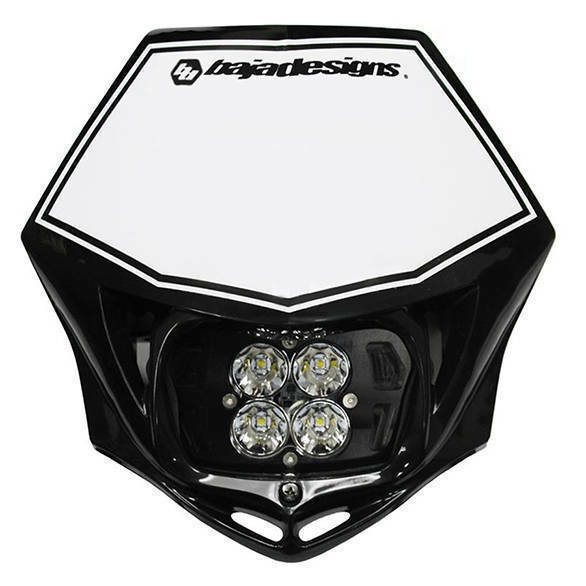 We are now currently testing the Rs 64,000 Baja Design XL80 lights. Remember to check if there's a dimmer available. Some of these lights are so bright that on light-coloured tarmac or in traffic, the throwback glare is impossible to live with. Are they legal? If not, how do I register them with the RTO? No. Almost none of these lights will pass a test of legality anywhere in the world. Auxiliary lights have come from competition use and their use is recommended outside of traffic. By traffic rules, you are allowed to have them as long as they are covered up in the day. We don't how the new always on headlamp law and the arrival of DRLs affects this part of the light world. Arguably the most legal of the lights is the Rigid SAE Driving Pattern light that uses a shaped beam that mimics the law-following beam pattern of an OE headlight while adding the brightness and power of the LED. I haven't seen this beam pattern in any other brand though. Not that you'd be able to explain any of this to a policeman on the road. Can I get the lights insured? Yes. They're electrical accessories and are insurable. You'll have to present the invoices for valuation to the insurance provider for the lights to be covered and it'll cause a small jump in the premium. In most cases the company accessory auxiliary lights are not as bright as the aftermarket and the prices are high too. So unless you're a stickler for company-branded gizmos or are super worried about your warranty, avoid these. Can I get it installed at the dealership, garage or can I do it myself? You can do it yourself and most service centres, especially for big bikes, will be happy to charge you labour and mount the lights for you. If the lights are sourced from an reputable Indian representative, warranty claims can be slow but should work. Everything else is a DIY project I'm afraid. Does it affect the warranty of my motorcycle? In theory yes. In most cases a manufacturer will void your warranty if the issue is traced back to the light or the way you wired it up. In practice, the cases of this are rare or unknown as far as we know. Brands and stores that you would recommend getting these lights from ? There are so many! We would start at Big Bad Bikes (bigbadbikes.com, Denali and SW-Motech) and Moto User (motousher.com, Baja Designs and Cyclops). Check out Facebook's sale groups for people selling Gold Runway and other brands. 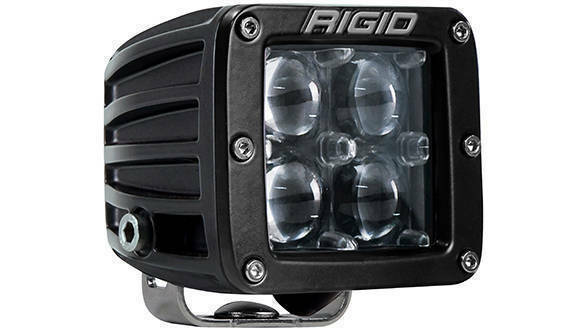 A number of Indian off-roading and 4x4 shops tend to keep Rigid Industries' lights. Clearwater Lights are not currently represented in India, though. And your local bike market is probably full of Chinese lights with no history, branding or guarantees to fit every budget. Got more questions? Leave us a comment, or tweet us!